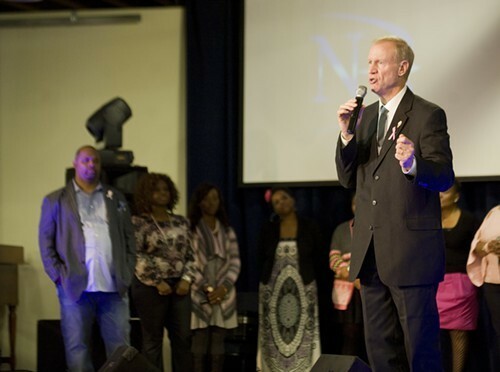 Republican Bruce Rauner addresses the congregation at New Beginnings Church of Chicago, whose pastor, Corey Brooks, has endorsed him. The latest twist in the increasingly strange, ugly race for governor came over the weekend, when south-side minister Corey Brooks said he received death threats, and his church was burglarized, after he appeared in TV commercials for Republican Bruce Rauner. As unfortunate as the incidents were, they also offered an opportunity for Rauner to make the news by attending Brooks's church, where he declared that they wouldn't back down in the face of intimidation. "This should never happen in America," Rauner said. It was just the latest instance of Rauner promising black voters he's with them. By no coincidence whatsoever, the next governor of Illinois will almost certainly be determined by a few thousand votes in Chicago, and both campaigns know the turnout in African-American areas could be the key. Republicans don't need to be reminded that they haven't won an Illinois governor's race in 16 years. That's largely because they've been clobbered in the city, which typically accounts for a fifth of all the votes. In 1998, George Ryan won 31 percent of the ballots cast in the city on the way to victory. In the GOP's three losing efforts since, its candidates have received 19 percent, 15 percent, and 17 percent. Four years ago Mark Kirk was elected to the U.S. Senate after getting 19 percent in Chicago. That was the first time a Republican senate candidate had come out on top since 1998, when Peter Fitzgerald won after getting 21 percent in the city. In the three elections between these victories, the GOP hopefuls polled just 16 percent, 10 percent, and 10 percent in Chicago—and all lost. What this means is that a Republican who gets 20 percent of the votes in Chicago is in great shape. On the flip side, Democrats who pile up city majorities of more than 80 percent are all but invincible. A similar formula holds in suburban Cook County, where the magic number for Republicans is 46 percent. If the Republicans can peel off a few thousand votes in the city and surrounding areas, they'll win. That's where African-American voters come in. On campaign stops in African-American neighborhoods, Rauner has been touting his generosity to educational causes, promising to invest in black communities, and blaming Governor Pat Quinn for violent crime. "Pat Quinn has failed the black community," he proclaimed last month at MacArthur's, a west-side diner, where he was surrounded by black ministers. In doing so, Rauner plays on the frustrations that some black leaders have with the state's Democrats, starting with house speaker Michael Madigan, who they believe have taken them for granted. "I don't dislike Governor Quinn. I think he's a good guy—I think he's a great guy," says Reverend James Meeks, a former independent state senator who's supporting Rauner. "But if you keep beating a dog, eventually he's going to do one of two things—he's going to bite you or he's going to run away. And that's how I feel." Cliff Kelley isn't buying what Rauner's selling. Kelley, a former Democratic alderman and longtime WVON radio personality, says neither Rauner nor his party has offered anything concrete to African-Americans. He notes that black voters once supported Republicans until Democrats won them over with the New Deal and civil rights laws. "If there was a real fight for our votes, I'd think it was great," Kelley says. "But this isn't a real fight." Rauner's record in the black community was spotty before he began running for office. GTCR, the private equity firm he led for three decades, had no African-Americans in top positions. At the same time, he's invested in privatized probation services that prey on the poor and for-profit schools that exploit students trying to move up the economic ladder. Quinn has his own issues—his administration is under federal investigation for a poorly managed antiviolence program launched on the eve of his reelection bid four years ago, and he's been criticized for failing to pump real money into schools and neighborhoods struggling with disinvestment. Tellingly, he's been trying to rally his party's African-American base. A week before Rauner went to church with Brooks, President Obama swooped into town and headed straight to a Quinn rally at Chicago State University on the south side. Thousands of people showed up, most of them African-Americans, and the president fired them up by ripping Republican tax plans that he said would help millionaires. Most significantly, Obama urged the crowd to get friends and neighbors to the polls. If they gave in to cynicism and apathy, he said, the nation's progress on jobs and civil rights could be reversed. "Hope is a better choice," he declared. "The first thing I'm doing tomorrow is casting my vote." It's doubtful that Rauner will rack up many votes in the city's black wards, where Republicans typically garner 5 percent or less of the total. But as Obama's appearance showed, Rauner has forced Quinn to play defense. That could help the Republican on the north side and the suburbs, where casting himself as a social moderate is far more likely to yield supporters. In the meantime, Rauner has started a new line of attack. Playing on fears of Ebola, he's assailing Quinn for not supporting a ban on travelers from three West African countries most affected by the outbreak. So far, though, Rauner has not scheduled a stop to discuss this proposal in a black neighborhood. In his first press conference since being elected, Bruce Rauner names long-time insiders to his transition team but reveals little about his plans in office. The Magnificent Mile goes for Rauner, while the black wards keep the faith in Quinn. Words I never thought I'd say—on the bright side, Speaker Madigan held on to his veto-proof majority. Who's paid for Pat Quinn and Bruce Rauner to try to win our votes. Is there reason to be alarmed about the Sun-Times? The Republican candidate for governor calls for a "high-quality education for all," but invests in schools accused of exploiting vulnerable students. While Illinois prisons are dangerously overcrowded, the GOP candidate for governor has made money from privatized criminal justice systems.